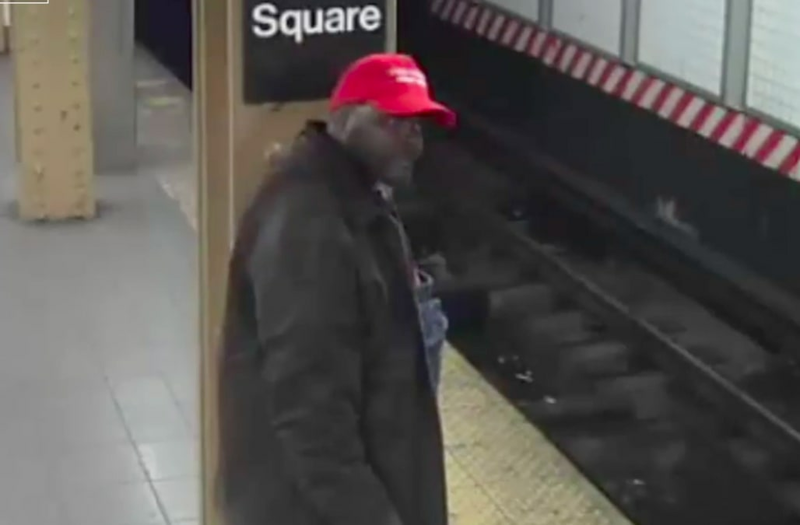 Cops have made America great again — by arresting the unhinged guy in a MAGA hat accused of shoving a Mexican immigrant onto the train tracks at Union Square, police sources said Thursday. The suspect, identified as Willie Ames, was being questioned for attacking construction worker Luis Lopez at about 8:15 p.m. on April 20, the sources said. Lopez was minding his own business at the station when Ames, sporting the bright red hat made famous by President Trump’s 2016 campaign, pushed him off the platform and onto the tracks. Lopez, who came to America six years ago from Morelos, Mexico, had just finished work. The suspect followed him off the No. 4 train and started spewing obscenities. “I don’t know why he targeted me,” Lopez said. “He started yelling that I was there to take his job and that we bring drugs here. “I fell head-first,” Lopez previously told the Daily News. “My head hit the railing. I tried to get up, but lost consciousness. I couldn’t move. My friend jumped in to get me out. He saved my life. Police grabbed Ames, 47, in Staten Island on Thursday morning. Charges against him were pending. Lopez was treated at Bellevue Hospital and released. Cops released a surveillance video of Ames sporting the “Make America Great Again” hat a day after the attack in the hopes that someone recognized him.